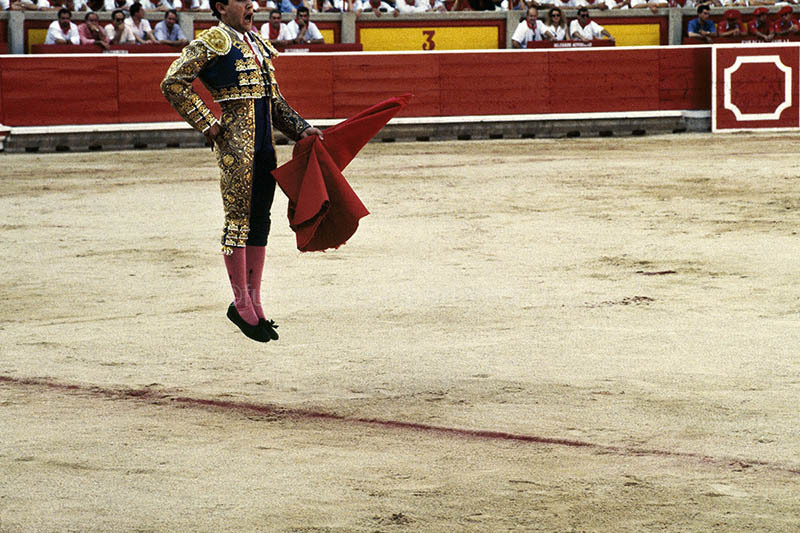 “The Running of the Bulls is just like Russian roulette – you never know what you are going to get” acknowledges Iñaki Vergara, one of the few photographers who gets the permit pass that allows him, as they say, the right to “perch” on the wooden fencing. 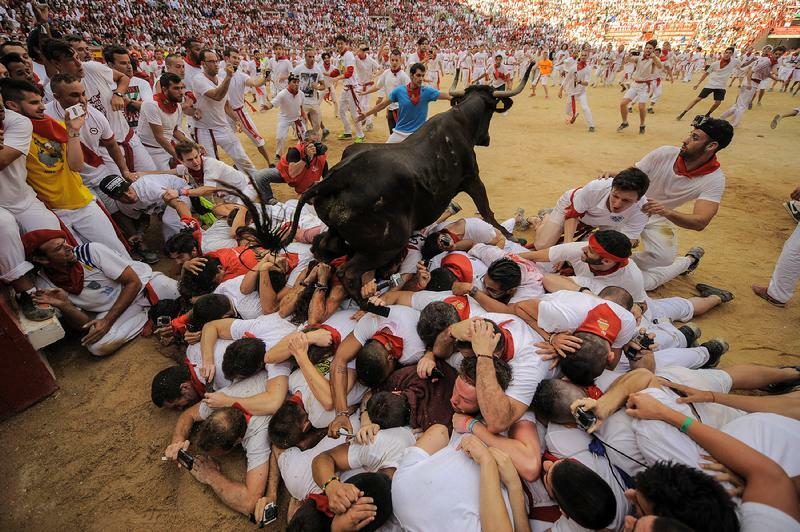 Last year it was precisely pure chance that gave him one of his all-time favorite snapshots and one that won him the VI Running of the Bulls Photography Competition for qualified professionals –awarded by Pamplona City Hall. This photo captures three bulls from the Fuente Ymbro bull-ranch, lined together like three athletes as they run after three runners who are also equally caught in a direct straight line. Interest in the Sanfermin fiestas is once again clearly shown from statistical data. We learn from the Pamplona City Hall Citizens Commission through its spokesperson, the councilor of culture, Maider Beloki, that according to official figures, the most-visited exhibition in Pamplona in recent years was, “Colgados de la pasión“ from photographer Pedro Armestre ” with a total attendance of 11.527 visitors. This exhibition was opened in the Palacio del Condestable in Pamplona on the 2nd of July and the exhibition continued to receive daily updates of photos from Pedro Armestre taken during the fiestas. 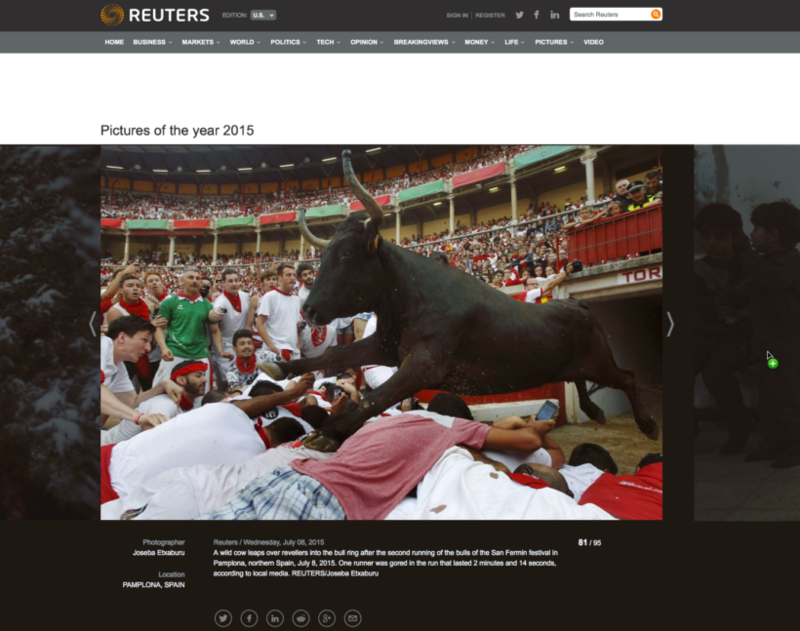 A Sanfermin snapshot from photographer, Joseba Etxaburu, has made the final list for the annual photo selection from Reuters for 2015. 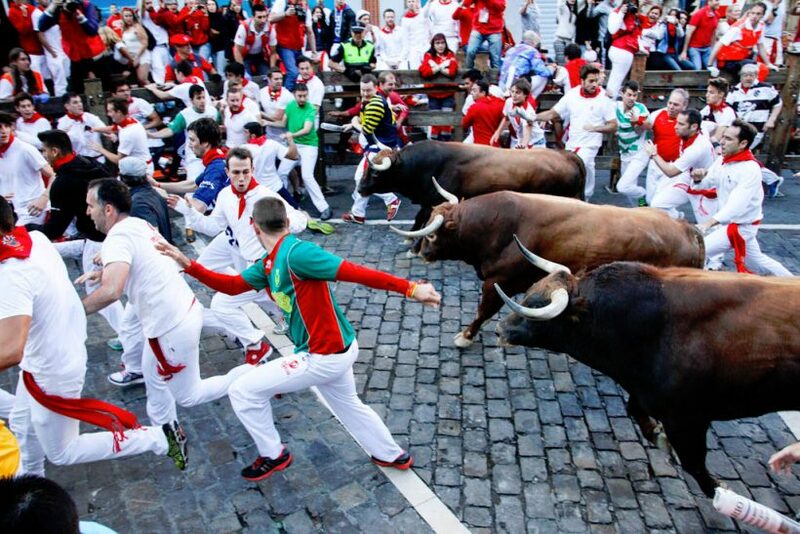 The snapshot shows a frisky young heifer charging into the Pamplona bullring immediately after the Running of the Bulls event, for the runners to play with inside the bullring. The photo was taken on the 8th of July, 2015. That same day, the snapshot was chosen as top choice from a list of twenty-five that is made by the editor of Reuters each morning. 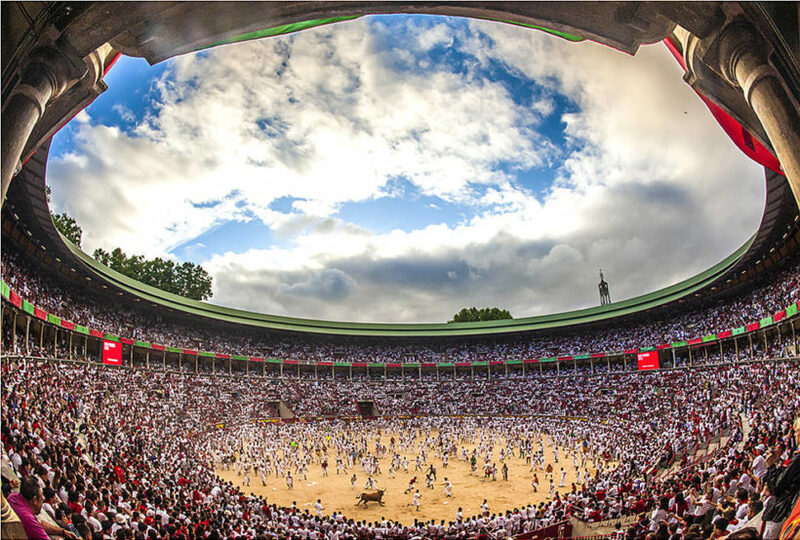 According to the Diario de Navarra local newspaper, the snapshot entitled “Después del encierro” (After the Running of the Bulls) from Carlos Mediavilla was awarded the San Fermin 2015 Photo Competition, which is jointly organized by the Santander Bank and Diario de Navarra and chosen by a jury made up of professionals from the sector. Second and third place went to Carlos De Cos and Ignacio Rubio respectively, from among the 900 initial entries which were scrutinized by the jury. There was a prize of 1000 euros for the winner with the runner-up getting 500 while third place received 300 euros. Just recently, the well-known photographer, Alberto Schommer died at the age of 87. He leaves behind him an extensive body of photographs which will keep his memory alive for many years to come. 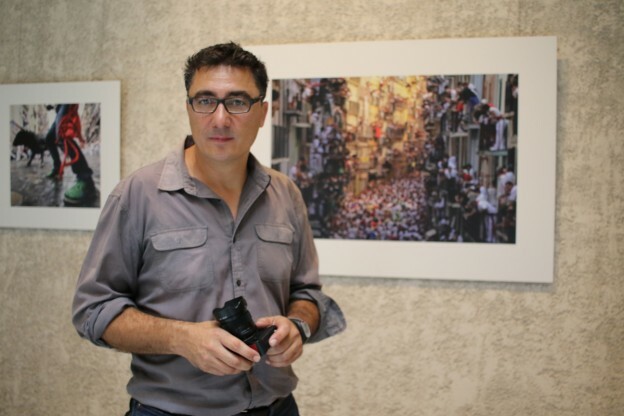 Among this work, a special book of Sanfermin photos under the title “FIESTA”. Schommer has been a distinguished photographer for the past fifty years in Spain, above all achieving international acclaim for his photographic portraits. He was awarded the prestigious Premio Nacional de Fotografía in 2013 and he was a member of the San Fernando Royal Academy of Art since 1996.